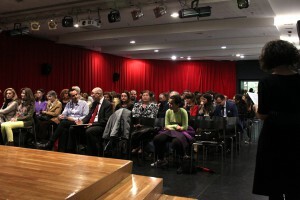 On Tuesday, April 30, at the Sagrada Familia’s Library, La Mandarina de Newton was at the awards ceremony of the III Scientific Writing Contest – Inspiraciencia, organized by CSIC (Consejo Superior de Investigaciones Científicas), with the support of the FECYT and the Ministry of Economy and Competitiveness. La Mandarina de Newton participated as part of the event’s organization and also presented the contemporary dance piece ‘Transposicionals’, co-directed with Big Bouncers. Inspiraciencia is a project of the Unit of Scientific Culture of the CSIC Delegation in Catalonia and the Institute of Science Materials of Barcelona (CSIC). It is a scientific writing contest opened to anyone interested in imagining Science through Literature. Participants can submit short stories or micro-stories in Catalan, Spanish or Galician, within one of the two contest categories, general public (over 18) or young public (under 18). The winners are selected by an official jury and by the public, which can vote on-line for the best text of each category, regardless of the language. The third edition of Inspiraciencia count on the participation of more than 500 works. The 15 winning and 13 finalists texts were awarded at the event of this year. The ceremony was attended by Lluís Calvo (Institutional Coordinator CSIC in Catalonia) and Jordi Muñoz (Writing School of the Ateneu Barcelonès), and also by the partners of Inspiraciencia and the participants of the contest. The ceremony ended with the dance performance, ‘Transposicionals’. With this performance we wanted to offer the public the opportunity to experience a different way of interpreting and communicating science. Art and Dance were the ‘tools’ we chose for this night. As we referred in the previous post, the show is an improvisation performance of dance, inspired by fragments of some of the stories of this year’s edition of Inspiraciencia. The dancers movements play with the scientific concepts of each of the texts, which are projected on stage as part of the show. You can check all the photos of the ceremony at our Facebook page. On Tuesday April 30, 7 p.m. at the Sagrada Família’s Library, La Mandarina de Newton and the group of dancers Big Bouncers will present the contemporary dance piece ‘Transposicionals’, at the awards ceremony of the third edition of Inspiraciencia (Scientific Writing Contest), organized by CSIC and the support of FECYT. This is a dance performance co-directed by La Mandarina de Newton and Big Bouncers. 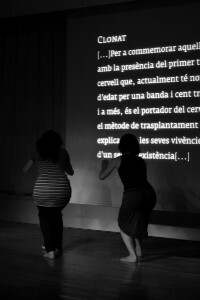 The performance is inspired by fragments of seven of the texts that participated in the contest. These are stories that explore concepts such as cloning, robotics, quantum mechanics, infinite, relativity, gravity and vacuum. The show that we will be presenting on the 30th, will be an improvisation performance of dance accompanied by an audiovisual work with the texts. The movements will play with the scientific concepts of the Inspiraciencia texts. We would like to offer to the audience a new experience, a different way of communicating science: through art and dance. When: Tuesday April 30, 7 p.m.
Where: Auditorium of Sagrada Família’s Library.